To switch things up for this weeks Bliss List, I thought I would share 6 of my favourite items for early autumn that I have been literally LIVING in. This cozy Barefoot Dreams duster cardigan feels like a blanket, perfect for sipping coffee while putting breakfast together in the morning or wearing over an outfit for drop off too…yes, it’s that great! 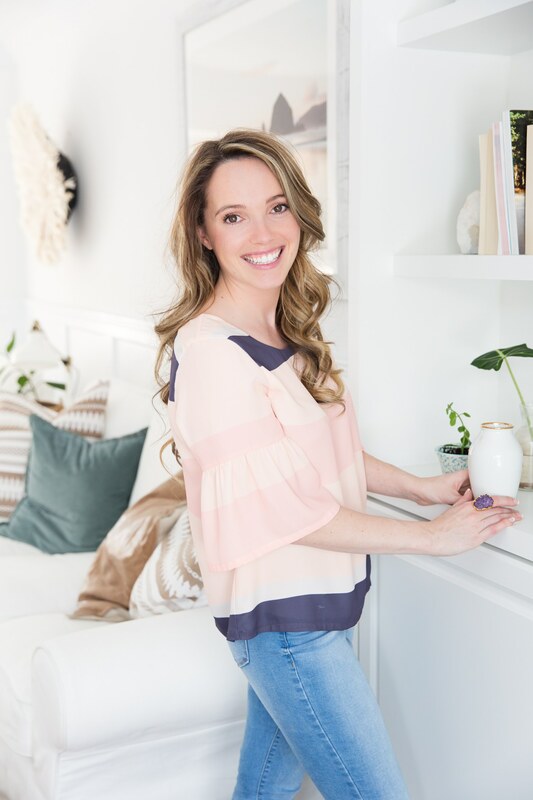 The kids always comment on how soft it is and snuggle into me on the couch and wrap it around them – it’s like a super snuggly mom cape and comes in a variety of colours right now (ahem, linked below of course). Well, we’ve linked all 6 items I am swooning over below haha! Sorry it has been so quiet over here, so much has happened since our trip to Disneyland both good and struggles too, there has to be a balance right? The coziest of cardigans of course, find my fav one (pictured above) here! 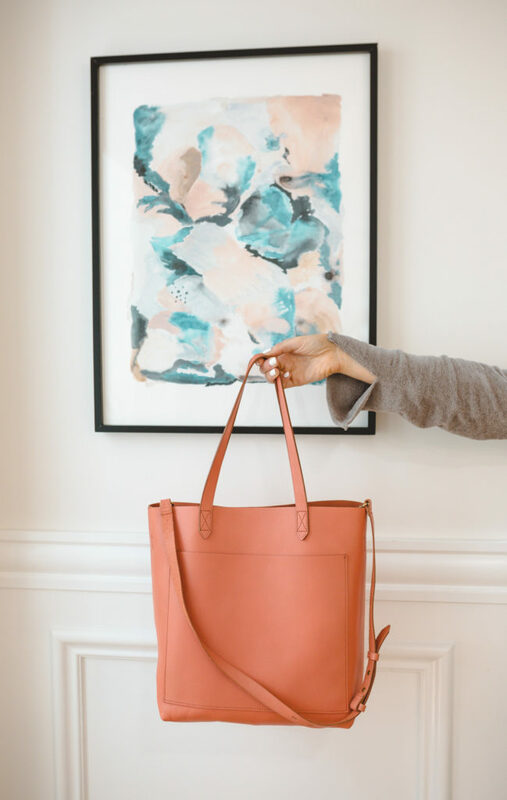 This spiced goodness Madewell Tote – it fits every thing, including a hefty agenda & laptop! I’ve been using it for all of my meetings and every other errand on my to-do list. It gives a nice pop of colour for fall but it’s great for the warmer months too! 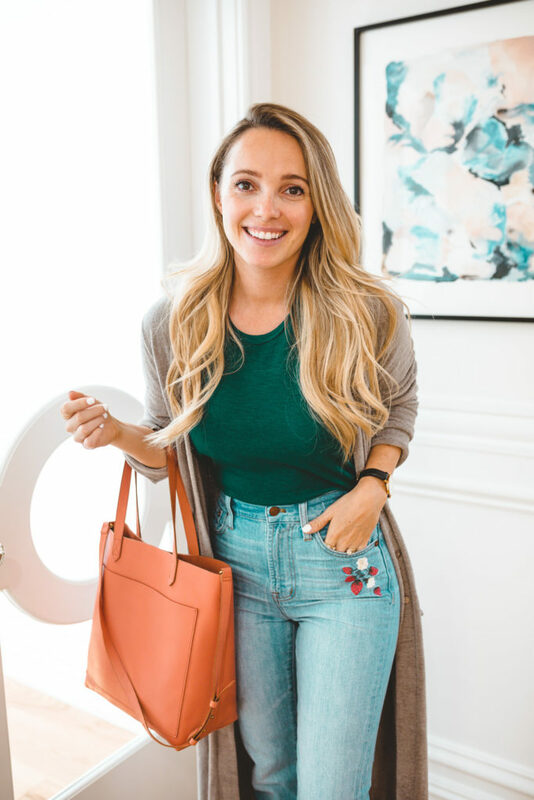 The two straps make it handy for us mamas always on the go and it even has a smaller zipped pocket inside to keep your wallet cozy. This Free People tank is so flattering in all the ways and comfortable on top of that, it has a little bit of a sexier cut to it but I love that about it! My every day watch is a staple by Daniel Wellington, black leather & rose gold with a chic white face. It’s durable (I’ve had it almost 3 years) and works with just about every thing! You guys know my love of high waisted jeans since having kids, I only WISH I didn’t have my mom throw out all of hers in my teens. What I thought would never come back in style then is all I want to wear now, she never fails to remind me of that fateful evening in her closet lol! 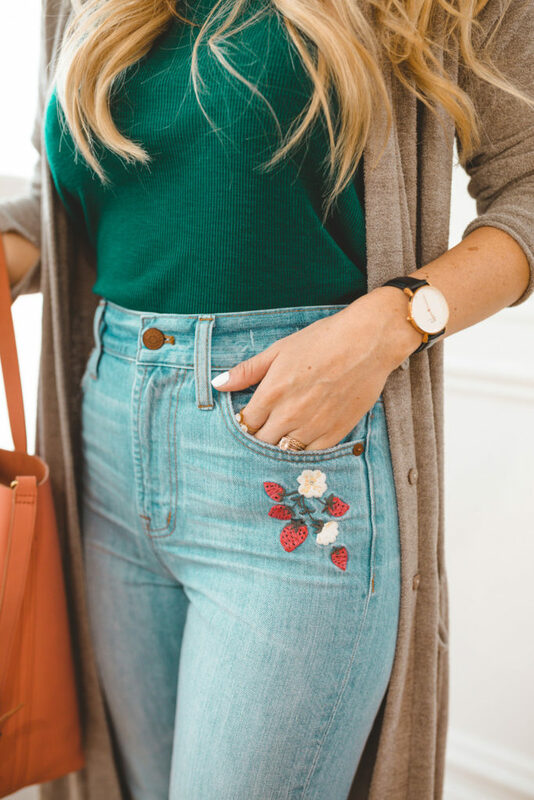 I have a thing for embroidered denim too, can ya tell? 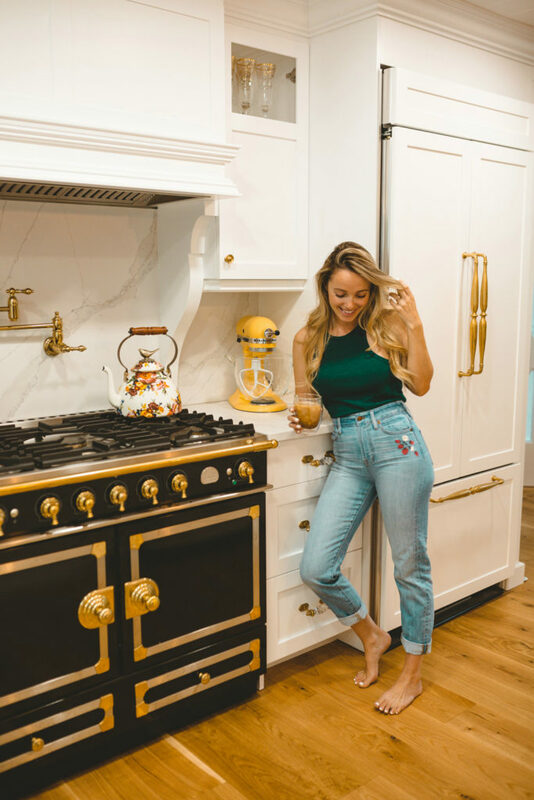 These Madewell high waisted jeans are super cute on and flattering too! The Tory Burch Mules, they come in both a navy, the perfect tan & black and they’re ON SALE. I am wearing the black ones in the first photo and they were totally worth the splurge. Super comfortable and durable. I’ve been wearing them for almost two months to pick up & drop off, grocery shopping, walking the dog..need I say more? You need them!